We surround ourselves with expensive gadgets and devices for comfortable living but ignore that one thing that surrounds us and is essential for a healthy life. We are talking about air, specifically the purity levels of air within our homes. Unclean air results in a number of health complications. Difficulty in breathing, allergic reactions, and asthma attacks are prone to occur if the air in our homes is filled with household pollutants, such as pollens, molds, dust, and smoke particles. Air purifiers restore the freshness of the air to a large extent. Cleaner air also helps us inhale more oxygen into our lungs which, in turn, yields many health benefits and brightens our mood. Inhaling more oxygen keeps us more energetic and strengthens our immune system. These health benefits provide extra fighting power to our body against seasonal and other diseases, such as coughs and colds, or common allergies. You can confidently opt for any of these air purifiers, but before making a final decision, think about why you need an air purifier. Is it because you need cleaner air to alleviate your allergies? Or is it to get rid of household odors? Perhaps your home is in a dusty area? Or perhaps your bathroom is developing mold? Any or all of these problems will not be solved if you purchase an air purifier that does not address that specific problem or problems. So, think about your needs and then match those with the solutions offered by the models below. This air purifier will be a great help for those who suffer from asthma or other allergies. The AeraMax 100 Air Purifier has been certified to be allergy and asthma-friendly. This air purifier has a “Special High-Performance Mode” that can be used when seasonal allergies are at a high point. With a sleek and elegant design, the AeraMax 100 Air Purifier can automatically detect air pollutants and contaminants and remove them to clear your surrounding air. This small air purifier will suit your budget and still perform many of the functions found in more expensive purifiers. The AeraMax 100 Air Purifier effectively removes odors from the air with its carbon filter. From cigarette smoke to cooking smells to pet odor, this purifier can tackle all of them. The AeraMax 100 also has a multi-layered air purification system. Apart from the odor-removing carbon filter, it also has two other filters with advanced purifying technologies. One is the “True HEPA filter,” which comes with the “AeraSafe Antimicrobial Treatment.” The other one is an ionizer, and its specialty is “PlasmaTRUE Technology” for removing air impurities. With a compact size but wide-ranging features, this highly efficient air purifier makes the list of “small but capable” purifiers under $100 that you can definitely consider for your home. Use it to get rid of allergens, odors, smoke particles, and germs in any room of your home. Apart from these specifications, the AeraMax 100 has some other useful features that are difficult to find in small, budget air purifiers. You can use its air quality indicator to check how unclean/ clean the surrounding air is. Also, you do not have to keep checking its filters to decide when is the right time to change them. Its filter change indicator will do that work for you. Another feature of the AeraMax 100 is its novel “Aera+ Mode.” This mode can be used to eliminate allergens and common germs from the enclosed area. It is pocket-friendly, so the coverage area of this air purifier is also limited to 100 sq. ft. When you need to move it to another room, you’ll find it to be an easy 9 pounds. The GermGuardian AC4825 is a tower-shaped air purifier that fits a small budget and works well in small areas, such as rooms of 155 sq. ft. This air purifier has a carbon filter to get rid of smoke particles. After that preliminary filter, it has a second and primary True HEPA filter. The third layer of its filtration process is made up of a virus and bacteria-fighting UV-C light, which helps eliminate those enemies of your health. Its other common purifying features include clearing household odors and getting rid of any unhealthy gaseous compounds. Those who are looking for a quieter air purifier will love this slender and lightweight model. It is ideal for a low budget, and its energy efficiency saves you some more dollars over the long run. It is one of those efficient but no-frills air purifiers that perform the essential functions of cleaning the air within your home’s walls by removing dust particles, mold, viruses, pet, and cigarette odor. But this air purifier does not have air quality or filter-change indicators. This lack of “extra convenience” does not affect its air-purifying properties, though, so if you do not mind a basic but excellent air purifier, then you can purchase this GermGuardian model with confidence. It’s also quite portable, weighing only 8.5 pounds. Another air purifier within a budget of $100 is the Levoit LV-H132, which provides great value for your money by its efficient performance. It is a high-quality air purifier that lands in the top ranks of popularity within this price range. The first thing you should notice about LV-H132 is its compact size. You can put it anywhere conveniently, and it will do its job conveniently. Despite its small size, this air purifier has all the necessary components to perform its air purifying function impressively. It has a three-level filtration process to clean the impurities from the surrounding space. The first level of air filtration starts with a pre-filter, supported by a True HEPA filter and, finally, a carbon filter. The LV-H132 keeps your expenses low even after long service as its replacement filters do not cost much. It is smaller in size, though, so its coverage area is also relatively smaller. It is an excellent air purifier for smaller areas, though, such as single bedrooms of 86 square feet or less. Within that area, it removes odors, allergens, and smoke particles with quick efficiency. It does not have any air quality indicator, but it does have a filter indicator. Considering its size, price, and features, the LV-H132 can be called a useful and smart air purifier. However, before deciding to purchase it, consider carefully how much area you would want it to cover. With all its excellent features, it is suitable for smaller rooms only, and putting it in a large space will render it inefficient. Its small size has another benefit, though – that of not cluttering small rooms. Despite being in the “budget” category, this air purifier has the added advantage of being energy efficient. It also functions noiselessly and provides you with fresher air at a fraction of the cost of more expensive air purifiers. When you want to move it with you, you’ll find its 6.5 pounds to be quite convenient. This is another popular GermGuardian air purifier, and one of the best that fits the compact budget criteria. It is an excellent purifier for smaller bedrooms, and its quiet functioning will not disturb your sleep. Its small size is ideal for rooms measuring around 78 square feet. In larger spaces, this small purifier will not be able to deliver as good results. But put it in a place befitting its size, and it will do an excellent job of purifying the air from bacteria, viruses, common allergens, and pet odor. This affordable air purifier has a simple design and is quite lightweight. It has a filter change indicator and a UV-C light that you control with an on-off switch. It also gives you the choice to adjust its fan speed for quiet or ultra-quiet functioning, depending on the air quality in your room. That way, it can perform its air purifying function without disturbing your sleep. Remember, you will have to change this fan speed manually. It isn’t an automatic function as some of the more expensive models have. The GermGuardian AC4100 has a HEPA filter system and a filter change indicator, alerting you when to do the maintenance work. It does not have any indicator for showing air quality. It also weighs less than 5 pounds for easy portability. Now, here is an air purifier that is really low budget – under $50! But it still performs all the air purifying functions adequately. Put this air purifier horizontally or vertically, and it will function smoothly. Its small size is also convenient for placing it on a table or desktop. The Holmes air purifier has a (comparatively) larger coverage area than the above models. It can effectively purify the air in a room of up to 109 square feet. With the help of multiple filters, this small air purifier can do wonders for cleaning your room’s air. Its HEPA-TYPE filter is capable of eliminating 99% of mold spores, dust, odors, smoke, and pollen like allergens. It also has an impressive ionizer that can remove any pet or other household odor. With so many benefits, it will not be too much to ask that you put in some cleaning efforts, will it? Its filters need to be cleaned once every month so that you can enjoy the best air purifying results. This air purifier has three speeds for air cleaning. The highest speed is relatively noisier, so it’s best to use the highest function when stepping out of your home. Turn it on and leave it to freshen your home for when you come back. The other two settings are much quieter and can be used as you relax at home or sleep. As you might imagine, the Holmes Desktop Air Purifier is quite light, weighing less than 6 pounds. There was a time when telephones were fixed pieces of technology. Now, we have mobile phones that we keep in our hands and roam around. Wouldn’t it be nice to have a “mobile” air cleaner too? the GermGuardian GG1000 fulfills that wish. Like a mobile phone, you can carry it anywhere. It needs to be plugged in and, after that, works small wonders by cleaning the air around you. It is made of plastic and does the work of cleaning air in small spaces. Use it in bathrooms, office cubicles, or perhaps take it along on a road trip in your RV! All you have to do is plug it, leave it, and then, observe how the air becomes cleaner in 24-48 hours. This handy air purifier eliminates air impurities of confined spaces by using a UV-C light. It removes odors, reduces bacteria, germs, and mold spores. It is not absolutely quiet and has a noise level of a small exhaust fan, such as those used in bathrooms. It does not have any filter and depends solely on the UV-C light technology. This means you also do not have to clean filters. All you have to do is change one UV-C light bulb once or twice per year. If you are looking for a stylish exterior as well as efficient functioning, then this Hamilton Beach air purifier will fit the bill for you. This cool-looking air purifier has a tower design with plain, knob controls. It has a permanent filter that can eliminate common allergens. This feature is useful for people who struggle with seasonal allergies. Since the filter is permanent, you can clean it with any vacuum cleaner and will not need to take the filter out for cleaning. It will also save you money as there will be no need to buy replacement filters. The air purifier has three speed settings, and all of them are super quiet. You can use the highest speed at nighttime, and it will still not disturb your sleep. This air purifier is also suitable for comparatively larger rooms and has a coverage area of around 160 square feet. It’s also quite light (approximately 6 pounds) and very low-cost (just over $50). This air purifier will be the choice of those who are environmentally conscious and would prefer to choose something that does not consume much energy. The O-Ion B air purifier requires very low energy consumption and uses different technologies to perform various air purification functions. It is a low-cost air purifier with a permanent filter that “conserves” your money also by eliminating the need for buying replacement filters. The O-Ion B-1000 air purifier has an electrostatic ionizer, carbon filter, and UVGI technology. All these purify the air by removing allergens, smoke, mold, dust, pollen, and odors. The technology used in this air purifier is quite effective in getting rid of germs, bacteria, and viruses. It has silent fan speed and a night light. it weighs approximately 3.5 pounds and is available for approximately $65. This air purifier from Honeywell performs well in small to medium-sized areas. In fact, it goes beyond that description and can purify the air in larger rooms too, such as in family rooms. It also has a slender, aesthetically pleasing shape that takes up very little space. For office use, it can be placed under the desk or table. In homes, it can fit unobtrusively in a kitchen corner. It works silently and has two speed settings. It has a permanent (no-replacement) filter that can be removed and washed easily. Unlike other low-budget air purifiers that provide only a 1 or 2-year warranty, this Honeywell air purifier comes with a 5-year warranty period. 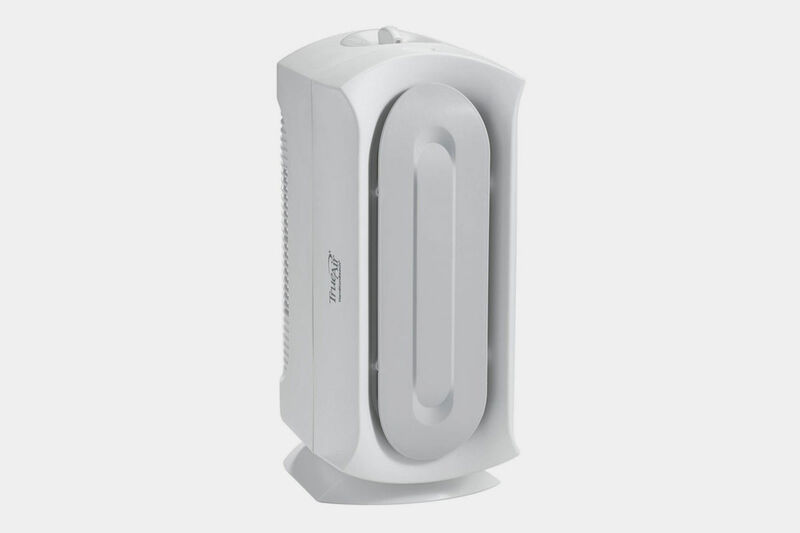 Honeywell is a well-known brand in air purifiers, and the HFD-010 has many features to justify the company’s reputation. Its permanent filter frees you from cleaning hassles and also proves to be a money saver. The air purifier has an estimated capacity of filtering out 99% of all air pollutants. These include dust, pollen, mold spores, pet dander, smoke particles, and household odors. Although this air purifier was designed and presented as suitable for smaller areas, it was pleasantly discovered by consumers that they could use it even in larger rooms. You won’t need to be very strong to move it, either, as it weighs a mere 7 pounds. Another entry from Holmes is this surprisingly efficient egg-shaped purifier. It can purify the air in rooms of up to 150 square feet. With its HEPA filter, it will remove 99% of all smoke, dust, pollen, mold spores, bacteria, odors, and pet dander. It also uses a variety of Holmes air filters so that you can replace the filter with the best type for your needs. If you have special help with your allergies, choose the Allergen Remover filter. If smoke is a problem in your home, choose the Smoke Grabber. There are also Total Air and Odor Eliminator. While you’re running your Holmes Egg, you can choose from three fan speeds. All are relatively quiet, but it does include a night function (and a nightlight) to allow the unit to function at minimum noise and with a little touch of hominess. The light is a soft white. It also has a filter monitor so that you can see when it’s time to clean or change it. Of course, it’s fairly lightweight at 5 pounds, so moving it from room to room won’t be a problem. The Holmes Egg also comes with a 3-year warranty, so you can purchase this model with confidence. Clean Air Delivery Rate (CADR): As the name indicates, this is the number that indicates the efficiency of that particular air purifier in removing pollutants from the air. Look for a higher CADR number while purchasing any purifier. Filtration Quality: Check the filtration level rate. The higher, the better. Area of Coverage: This will give you a fair idea of how much space can be covered by that purifier. Using an air purifier in a room larger than it’s rated for will significantly reduce its effectiveness. Ozone Production: Some air purifiers take a shortcut to remove odors. They release a higher amount of Ozone to complete the air-cleaning task. But that can have a negative effect on your health. So, do not forget to check the limits of Ozone production in your selected air purifier. Carbon Filter: This is not the main filter but a secondary one, which acts as a “pre-filter” for the primary filter. This additional feature helps in removing odors and thus keeps your surrounding environment cleaner. Keep these in mind when you make a decision for the most useful air purifiers under $100. Remember, even the best one can seem to be the worst for you if it does not match your needs.